After my motivational PB swim on Saturday I was craving a motivational marathon time to boost me for Ironman Lanzarote. 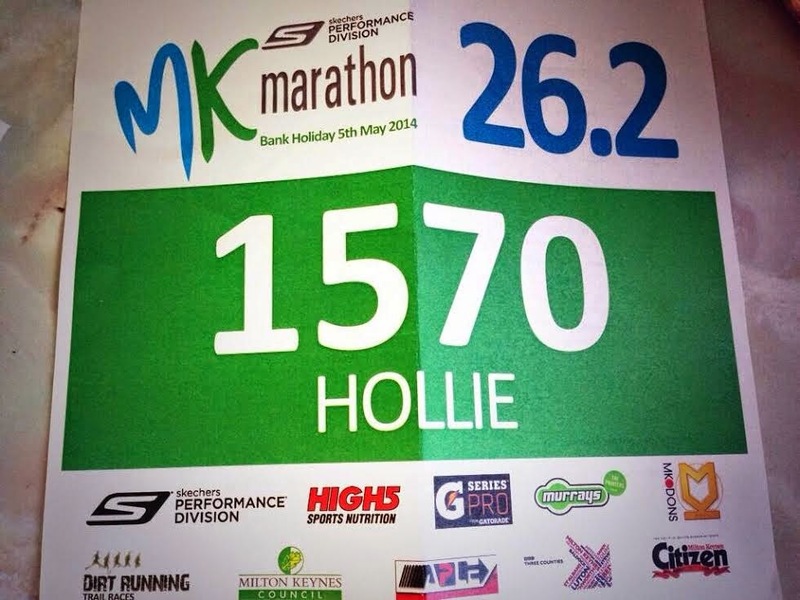 As I mentioned in my previous blog I will always include a marathon in my Ironman training. This may be a mental decision more than a physical one as I personally need to know that I have got that mileage in my legs so I know I can do it. Seeing as an Ironman or any endurance event is half mental I really don't have to justify it any more than that to anyone. I do admit that twelve days before an Ironman isn't ideal but it had to be done. With this ideology I will also be looking at doing another one in summer before Ironman Wales. 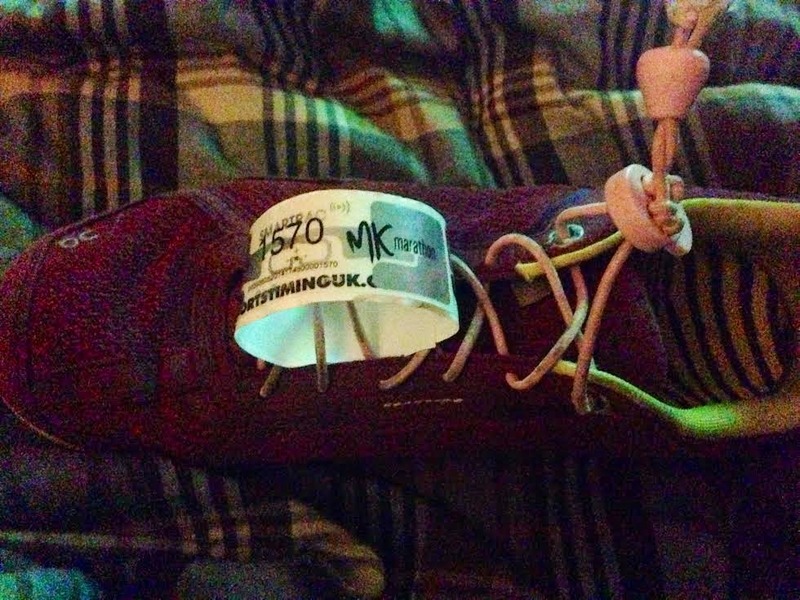 This contraption (paper) on my trainers is actually a timing chip! I went into bank holiday Monday with a positive mindset. I prepared all my kit the night before and then unfortunately had a rubbish nights sleep. This always annoys me as when I eventually doze off it then seems impossible to wake up again. Getting out of bed was tough and I muted my alarms too many times until I had none left. I was lucky I even got up in time to make it to the marathon! This late start meant I missed meeting up with some Twitter friends that I had agreed to meet, sorry, and didn't have time to have my trusty porridge. I was not that worried about missing my porridge as although I rely on it heavily, recently it hasn't boded too well. Without sounding too crude my pre race nerves mean I don't actually gain much energy from it so wanted to trial another pre-race breakfast. I didn't really have much choice as I only had the motorway services to make my selection. I had thought a bacon sandwich may be a good shout but decided against that as was unsure how much grease there would be in it (I am a cut the fat and then dab the oil off kinda girl). I played it safe(ish) and went for my favourite sandwich, ham and mustard, with a blueberry muffin and coffee. If I didn't stomach the food at least I had some caffeine for energy to start the morning off. When I arrived near the stadium in Milton Keynes where the start was I parked in an industrial estate and walked to the stadium. The race started at 10am and I arrived at 9.30am. I had my bag to drop off and by that point needed the toilet. 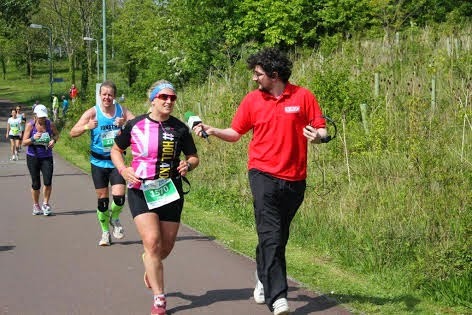 I would have no time to think before running - just the way I like it especially as I had travelled to the event alone. This thought made me laugh, the amount of events I have done now has meant that running 26.2 miles is 'just a marathon'. I later found out that I craved support during this event and figured that no matter how many marathons you have done they never get any easier (this was my 5th). I can't be critical however as my mum had offered to come and support me despite being 2 hours away. 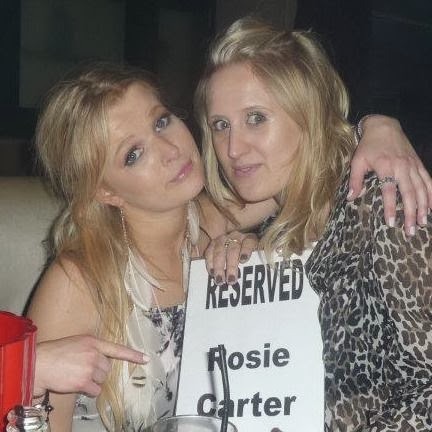 As much as I wanted to say yes the night before I declined as didn't want her to travel all that way and brushed it off saying, "it's only 4 and a half hours, you'll have 17 hours of spectating in 2 weeks time!". I am so grateful to all of my spectators throughout the years and feel guilty they use their day cheering me on. I managed to put my bag and go to the toilet with 10 minutes spare to get to the start line which I got to with 5 minutes to go. I spoke to a few other competitors and then heard the 10 second countdown. I had gone into the race with the intention of getting a 4h30 time. I wanted to hit 10 minute miles consistently as that is my comfortable pace. For some reason as soon as I crossed the line I began to get emotional and was trying to push back the tears which had already began to fall caused a pet lip. I don't know why this happened but it may have been a combination of a tough emotional week after Rosie's birthday, London to Paris, little sleep, being alone and the constant reminder during events what the story behind me running is. I also did something I never do during this particular marathon; I used my earphones so I could listen to music. I normally begrudge people who use these claiming that you should take in the atmosphere. I also never use these during events, including marathons, as I cannot do so during a triathlon. My only exception to this rule was obviously now and when doing interval sessions at the gym. Today however I felt that I may need some music to boost me on. That said I only put one ear in and was merely to focus me. 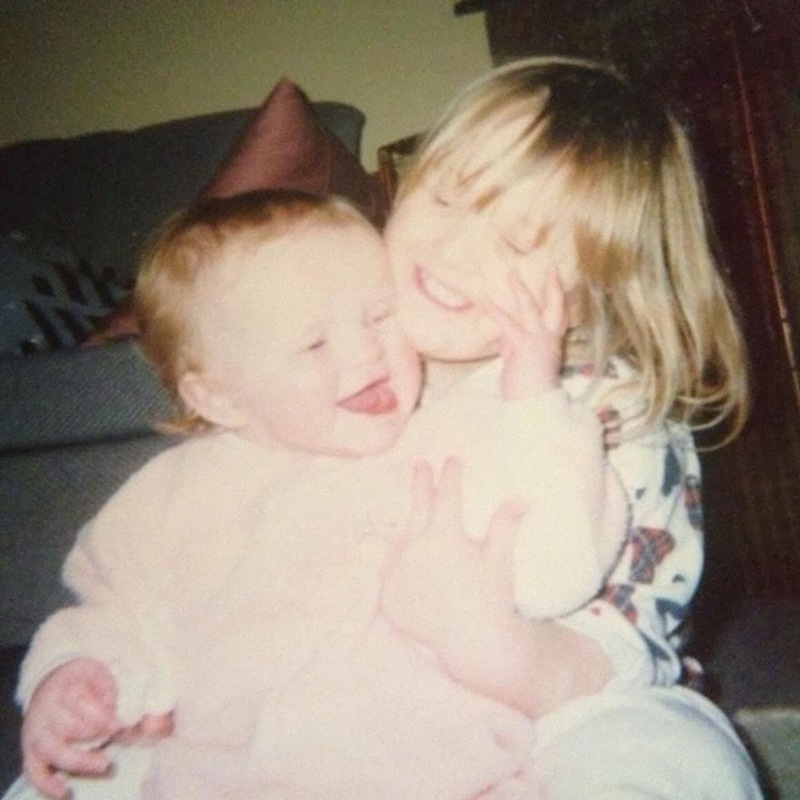 What did really break me down early on was the first song that came on when I shuffled my music was a song that reminds me of the day I found out about Rosie's death. I didn't know whether to smile or cry so what I did is grimace look at my Garmin and focus on hitting my 6min/km splits. The beginning of the route wasn't particularly exciting, as some may know Milton Keynes is full of roundabouts and the first 10 miles was spent on dual carriageways and slogs uphill to the next roundabout and then doubling back. This meant that I could see other competitors on the other side of the road and I kept an eye out in case I recognised anyone as know some Twitter followers were doing this event. 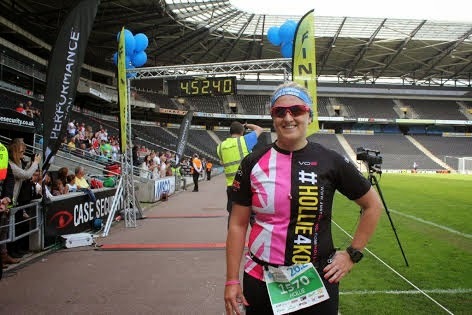 With my Hollie4Kona running top on I would be easy enough to spot. Even within the first few miles I felt uncomfortable, not with my pace but with my stomach. I felt bloated and sick yet needed energy. On top of that the weather was scorching and although this was what I wanted in a way as training for Lanzarote there was no wind and the UK heat always seems so suffocating. The boringness of the course and me being so uncomfortable made me dread the thought of this being a 2 lap course, thankfully it wasn't and at mile 10 the marathon route turned off while the half marathon runners made their way to the finish. Never before had I been so tempted to continue straight on and 'pretend' I had accidentally missed the turning but no matter how bad I felt I was seeing this through (for a little longer anyway) - I am no quitter and I would only be cheating myself. 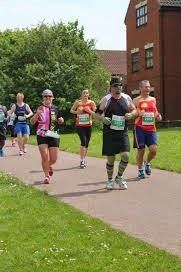 It was at this point I bumped into a fellow runner who actually wanted to talk to me! (I had grown tired of my earphones by this point, the conflicting beats were affecting my pace). I ended up staying with this particular runner, Mike and his partner, Amanda, for the next 11 miles. I was still keeping my pace but was struggling even more by this point. At the 9 mile point I was thirsty and needed energy. Although my stomach turned its head up at the thought of such a thing I attempted a gel and spat it out and then walked through the aid station to glug back a whole bottle of water and Gatorade - in hindsight this made it worse. So by mile 11 I was suffering and although my pace was still on track I was feeling rough. I spoke to Mike for a few miles about my story, work, training and his and Amanda's desire to complete an Ironman. He was a 3h30 marathon runner and pace maker and this was his 19th marathon. He was running at my slower pace as his partner Amanda, who was a few metres behind was doing her first marathon. I was enjoying talking and was really grateful I had some company at this point. I was however finding it increasingly tough to stick to my pace and I began to slack. However I still managed to hit my desired 2h10 marathon time - I just had to keep the pace up in order to get my wanted 4h30 finish, something I knew even at that point would be tough. By this time I had spat out another gel but was pushing on through. I also had the company of Amanda now and although was slowing the pace found it my knew mission to get me and her round in one piece especially as she was struggling too. We spoke about Ironman, bikes, holidays, and aspirations. It really is amazing that running can bring people together. We even got quite deep and spoke about how we only have one life and you need to do what you enjoy and what is enriching. We spoke about our own previous battles in our lives which is pushing ourselves beyond what is comfortable. Around mile 15 I had decided on a new strategy, this was to keep drinking water with the aim to try and flush anything swirling in my stomach out. Over time it began to have a positive effect and always ran with a water bottle from that point taking sips every so often. This is a strategy I can turn to in Lanzarote if need be. At mile 19 my new companions decided we should play a game. This was to go through the alphabet naming a band or singer - it nicely bided some time and distracted us from the discomfort. Amanda was looking forward to hitting the 20 mile point, as was I, as this meant we were 10km to the finish which as I worked out was about an hour. I normally speed up at this point but still did not have it in me. At mile 21 though I did. The pace I was running with Amanda was getting a increasingly slower and my bloated stomach had subsided somewhat so decided to pick it up. I felt bad for leaving especially as she had helped me as much as I had her but I needed to push on for my own mentality. Although I came alone and had no spectators per se my coach Mark was there supporting the runners and his clients, such as me. I had seen him twice before, once at mile 7 which was very much needed for my morale and was great as I got a big cheer from Mark's wife Clare. It was great to see a friendly face and it really spurred me on especially as I was struggling. I also saw him again around mile 17 when I was in the middle of my despairing period and again it was great to see him. The course from around 16 to the finish was that lovely word 'undulating' and this was down underpasses and back up, this really took a toll on my energy, morale and legs. However during my 'good' phase (mile 21-finish) I saw Mark again around mile 23. 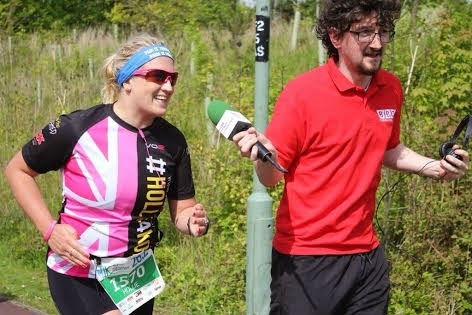 He ran with me and told me that BBC Three Counties were around the corner and wondered if I wanted to do an interview with them. I said I would but I wasn't stopping so that's what happened. I spoke about my story and about Rosie. With this extra bit of excitement I really picked it up and pushed hard to the finish. "I'll talk but I'm not stopping!" Rounding off into the stadium I began getting emotional as it reminded me of the Reading half that I did with my sister Emma. 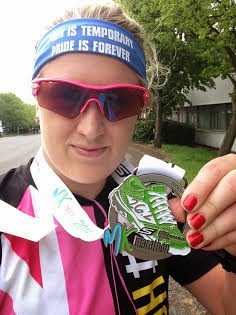 I pushed on for a sprint and finished (Garmin time) in 4h42. I was relieved as at one point I never thought I would get there given my struggles early on in the race. Yes I was 12 minutes over my desired time, but it was still not a bad time and I kept running, I overcame sickness and have learnt from it. I couldn't help think for a second what if I wasn't ill? But I admitted I had a bad blip and recovered from it. Furthermore I kept someone else company and helped them on their road to becoming an endurance athlete. I did all this in under 5 hours. Mark came running over to me at the finish and gave me a big hug and said how proud he was. In that moment I was certain I had made the right choice when picking my coach, he truly cares about me as well as my success. I had a picture by the finish line (although the time is 10 minutes after a finished because I was hanging about to see Amanda and Mike come in). I saw Amanda become a marathon runner and she did so in under 5 hours. I was so so happy for her and apologised for running off as well as thanking her for her company. I wished both her and Mike luck in becomnig Ironmen. So I hobbled back to my car with my lovely shiney around my neck. I was pretty emotional throughout this day as you may have guessed but now I really was. I began to cry and think. For the first time I was actually proud of myself. This marathon really tested me and I truly felt like I deserved the medal I received that day. On top of that I have learnt from it and can take this with me to Lanzarote, especially if I begin to feel sick again. I spoke to my mum and my sister on the phone and then drove back. When I got back I spoke to Mark about how I was feeling and where to go from now into Ironman Lanzarote. He also mentioned that every time he saw me during the marathon I had a good run technique, I would never have thought I would hear this considering my background in running. Shows how far I have come and what I have learnt from Mark. Apparently I kept good form through to the finish. After that chat he sent me a message saying "Just done a really fast 10km, thanks for the inspiration". I can't even begin to imagine what his normal pace is let alone his fast but I was truly honoured to think I could have inspired someone like Mark who has achieved so much in the endurance world. Even if I will always describe that event as horrible I will always remember the eventual result and day as a positive one. So these will be the last few words I shall write here before Ironman Lanzarote. I want to thank everyone for their continued support, whether that be friends, family, spectators and online followers. Your support has kept me going and made me feel like my goal is worth fighting for and achievable. I fly to Lanzarote early on Sunday morning and then I have 6 days there before the main event and then 5 days after to drink cocktails! This half of the journey has been tough emotionally and physically. I have sacrificed a lot to even be considering competing in Lanzarote. So what do I aim to achieve there? My best friend who is joining me out there said to not put too much pressure on myself even with what I want to really achieve and I mean it when I say, I honestly just want to enjoy the race and the atmosphere pre, and most importantly, post event. I never got the chance to take in the sheer joy, pride and mutual camaraderie I expect there to be at the finish line of an Ironman due to tragic circumstances I was put in last September. I therefore hope I can throw myself into that experience this year. I have no doubt in my mind it will be emotional. I have held a lot in and training has always been for an emotional cause. During those tough 112 miles on the bike I am sure many tears will be shed when thinking why I am doing what I am doing. Ironman Lanzarote I am ready for you and I will be doing it all for Rosie, my inspiration and my motivation. I hope I make you proud.